In this episode: I get to talk about about my knitting to a real, live person! Such a treat. 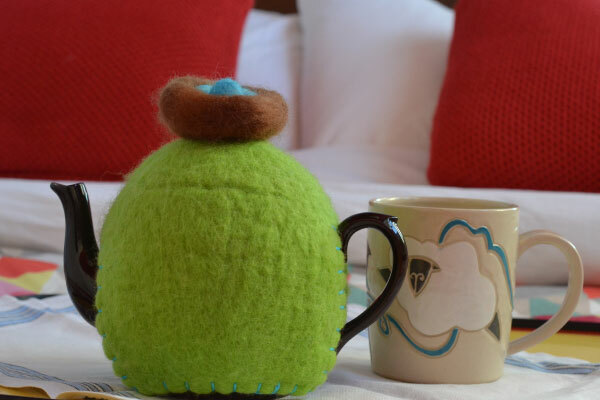 We are in my guest room with refreshing bevvies and Amy Singer for a P3 wrap up, some sweater fixing, shawl knitting, and shameless self promotion. Mark and Estelle, of Squeaky Elliot, made Amy very happy with their range of hand dyed linen and Gower Wool, a lovely DK weight blend of BFL and Welsh Black wool from their family-owned flocks. (You won’t find the pink yarn, pictured left, in the shop though. I went there to find the shop URL, got distracted by the pretty, and bought both skeins!) Estelle also wrote about the marketplace in her blog. P3 has a new name! 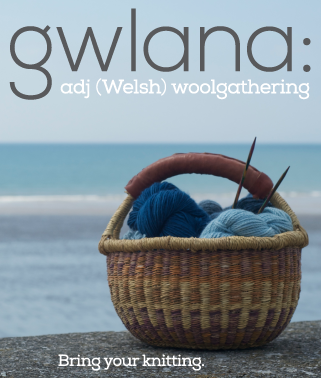 Gwlana, you may recall, means “woolgathering” in Welsh. 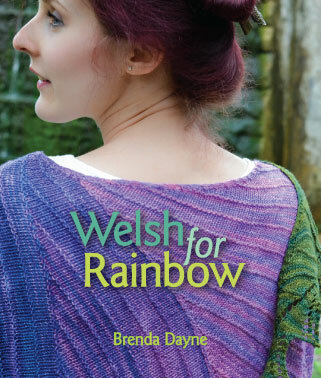 We think it’s the perfect name for our little knitting retreat business that began here in Wales back in 2010. Our next Gwlana Retreat will be held from 11 – 14 October 2013, in Pembrokeshire. Visit us on Ravelry and Facebook to stay in the loop. Yes, we do wax poetic about Tom Bihn bags. This is because Tom Bihn project bags are wonderful. They are wonderful because Tom Bihn listens to what knitters say they want in a project bag, and designs his bags accordingly. Would that more manufactures were like Tom Bihn. Amy’s Henslowe is being knit in 100% silk mystery yarn that looks like the sea. Be sure to click the sound link in the upper left corner of the video. The book that made Amy fall in love with garter stitch is The Knitting Experience, by Sally Melville. On the needles at Ty ((It occurred to me recently that referring to my home in Wales as “Casa del Cast On” was, in a word, stupid. Ty means “house” in Welsh, and I’ll be using that instead in the future.)) Cast On, the Lune Shawl, by Mirium Felton, in my own Shetland handspun. Only one small mod: I knit the edging from Simmer Dim. If I sound underwhelmed by the yarn, it’s because I am. I rather ruined it by adding to much alum to the dyebath, way back when. I can’t NOT use my own handspun, and it’s not terribly scratchy. 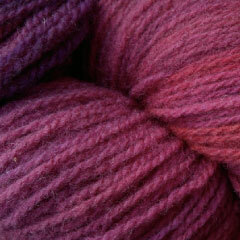 That said, if there’s a way to add softness back to alum-stripped yarn, I’d love to hear about it. 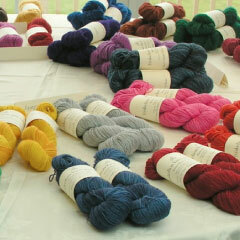 Amy has already arrived at Whitebarn Farm, where she’ll be teaching Sweater Success. Do sign up if you can make it. It’s going to be a great weekend. Later this year you can join Amy in Iceland. I’m currently putting together a new tour for this summer. You’ll find me at FibreTrain, in Nampa, ID (that’s near Boise) over Memorial Day weekend, and in Atlanta 14 – 15 June, with the North Georgia Knitting Guild. I have the weekend of June 1-2, and June 8-9 free to teach, and am looking for a yarn shop or guild on the east coast who might be interested. If you’d like me to teach near you, please drop me an email with the details. Amy’s Audible pick this week is (unsurprisingly, to those who know her) Neverwhere, by Neil Gaiman. Click the enormous logo below to sign up for Audible today. Music by Brian Mazzaferri, Silly Song. I’ve been waiting for another podcast. WOW this will be great to listen to as I “try” to clean and organize my quilting/knitting stuff. Thank you! Brenda! You’re back! Everything stopped, I pulled out my knitting and listened. Thank you! Thank you! Thank you! Couldnt find your vine video. What are the tags? Wilma, I embedded the video, but I can see that now it’s not working. Bummer. I’ll see if I can figure out what’s up. Good to hear from you, Brenda! I don’t know how much alum you used. 7% cream of tartar is often added to a mordant bath to soften the wool – it may help after the fact. Hair conditioner will help. I have also used dissolved hide glue – about 2 tbs to a gallon – it acts like hair conditioner but protects the wool in an indigo bath so will help to soften the wool. Hi Brenda- lovely to hear your voice again and a bonus with Amy. I enjoyed meeting you in the flesh at Madrona, which makes listening to your podcast extra special. In your hiatus, I tried a few others, but nothing compares! Hurrah! The video of how to wear the scarf! Of course, I am going to have to watch it in slo-mo about one hundred times to figure this out. But once again you have saved my fashion sense. Thank you! Wonderful ukulele song at the end. What is it? 1. I keep re-watching that vine video instead of working on my dissertation. I’m mesmerized. 2. Also, I love the colors of your color affection! It makes me want to cast on a second one! I agree with Diane – The only dyes I use on wool are natural dyes, so I, unfortunately, have had some experience with this. I’d try the hide glue. I’ve seen it do wonders for softening sticky or harness caused by dyeing. If you need some, let me know. Okay, I’m only on episode 11, back in 2006, but when I saw that video just now, I HAD to click on the sound… and then I watched you rock that shawl about 15 times in a row. FUNNY! I loved it. YAY I missed you brenda! Did I hear Pacific Northwest for a future gathering? Where do I sign up?!!! Great episode as always. Loved the video and the ukulele. Thank you. Lovely to hear the two of you together and glad to hear about a successful Gwlana. I will be waiting to hear if your Pacific Northwest thoughts take hold. Count me in! Great to hear you again! The notification isn’t working, so might be a little late. Since you are going to TNNA, would you want to stop by Cincinnati and teach a workshop? Yes! And she is back! Great to hear your voice (and Amys :-)) Trying to get my friend to sign up for your retreat in oct.. That would be such a treat! I would love to see her come to south florida an visit us at ace sew vac..Great to hear you again.. Awesome welcome back!! I wish there were workshops in the South ;o;! Loved to hear the two of you in conversation. As I am now in a wheelchair and still knitting I wanted to find out whether the retreat will be suitable for physically challenged knitters. You are keeping me sane! I developed bilateral optic neuritis and went completely blind in the middle of March. No quilting, sewing, reading, TV, driving, game playing or color in my life! Your voice and the process of teaching myself to knit by feel has helped to keep my manic roided up brain from exploding. That aNd sitting is all I could do! I have about 40% vision now ( little to no color) so I just wanted to say THANKS! It is quite a life lesson and When finished I will wear my little garter stitch shawl with pride–dropped and twisted stitches and all. And I will remember your voice with me in the darkness! You did a good thing! Thanks for coming to Nampa! It was a great class and getting my hands into my knitting is just what I needed to make everything click. I’m so excited to knit myself and then my family sweaters! Yay! Brenda – I was so sad yesterday when I checked your blog and it didn’t load. Today it did! Hooray! Any chance you will be podcasting again? I so miss hearing about your adventures.